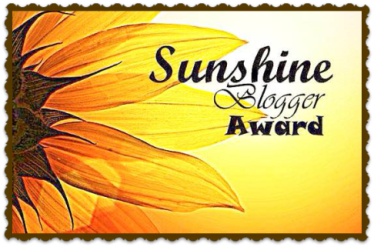 Many thanks to Maddy for the Sunshine Blogger Award. Who is your favourite author? Oh my, this is too difficult for someone who loves reading and writing! It changes all the time, as I find new authors I enjoy, and work my way through their books. Ones I keep coming back to are John Irving, Iris Murdoch, Nevil Shute and John Steinbeck, my current favourites are any British literature from the 1950s/60s. I am currently reading Zola, The Ladies Paradise. My first books were Enid Blyton especially the Malory Towers series and Heidi by Johanna Spyri. I really do love reading, so if anyone has any good recommendations please let me know. 2. Your favourite singer? Much easier – David Bowie. Especially Ziggy Stardust and Aladdin Sane. 3. Your favourite character in history and why? Again, much easier, I would choose my grandmother, May Annie Doris Cockett (known as Queenie) and I would ask her who my grandfather was, and why it was so difficult for her to choose to give her daughter (my mother) to another family. Without judgement I would love to talk through the circumstances of my mothers’ birth and hear Queenie’s point of view. When you first started your blog, what was your main aim? What are you most proud of that you’ve found? This entry was posted in Queenie Cockett and tagged David Bowie, Iris Murdoch, John Irving, John Steinbeck, May Annie Doris Cockett, Nevil Shute. Bookmark the permalink. Oh I loved Heidi and I was such a Mallory towers girl too! Many of your favorites are mine as well. Thanks for answering my questions! Ah yes, Black Beauty as well. Congrats, Jackie! I love that you chose your grandmother.